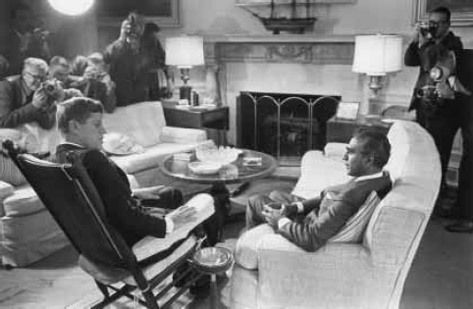 1) Rusk quote on “disorders” in letter to Home, transmitted 19 February 1962 as State to Embassy in U.K. ; Kennedy in meeting with British, 30 June 1963; both FRUS 1961-1963 , vol. 12: docs. 264, 295; also docs. 249-51, 253, 258, 263, 267 (second attachment), 272-3, 276, 278, 280-1; FRUS 1964-1968 , vol. 32: docs. 370, 371 (attachment), 373; “Kennedy Refuses Aid to Guiana; Ties to Reds Termed Reason”; “C.I.A. Men Aided Strikes in Guiana Against Dr. Jagan”; “A Kennedy-C.I.A. Plot Returns to Haunt Clinton”; all New York Times , 9 July 1963; 22 February 1967; 30 October 1994; Waters and Daniels (2005: 289, 302, 305).